Life skills need to be taught. These can run the gamut, from cooking to laundry to maintenance to upkeep. We have finally tackled the painting of the kitchen after a leak last fall that required a new roof. We involved our girls in most of the work and decisions, so that they will gain the life skills they will need later on. When we were talking about paint colors, they we there and gave their input. We chose white for the walls. Cabinet color is still being decided on because we can’t paint those yet. But they see the samples up and add their two cents when we decide to remove one of them that doesn’t seem to be working. They helped prep the walls and ceiling, from clearing out to cleaning and dusting to taping off. They helped choose light fixtures and then learned a bit about how to change out a light fixture, including where the breaker box is and what the switches in it mean. They helped clean up and put things back into the kitchen. And they accompanied us on fact-finding missions to the paint stores while we were figuring out how to do the cabinets when we have warm enough weather to be able to open windows while working or keep the garage door open while dealing with the cabinet doors out there. They will be a part of the cabinet work, also. Do you include your children in learning life skills? What have they learned recently? One of the events in the Lads to Leaders program is about home skills. For the girls, it is called Keepers (as in keepers of the home). For the boys, it is titled Providers. There are wonderful, necessary skills taught in each on, as well as the idea of serving others with these skills. I really like this program and all it is teaching. My girls worked on Keepers this year and did the section about food preservation. They had to get and put up 10 containers of a food, including giving one to someone who might need it – a widow or widower, a family who is struggling financially, a single person who might need it, etc. I wonder if painting would have fit under part of the Providers program (they can do one Providers activity, as well). We will have time for that, though, as all three girls would like to update their rooms. One of the girls is going to downsize her items significantly so we can put a larger bed in her room and it can serve as a guest room as needed. Lots of painting will probably happen soon. So the life skills they learned will be coming in handy. No one likes chores. I don’t like chores. Why would I expect my children to like chores? It is such a hard word. Required, no fun, almost like punishment. So, why not try – contributing? We ask our girls to contribute to the household in the ways that they can. They are not old enough to earn money with an outside job but they can fold the clothes. They are not all old enough (or really tall enough) to reach to the bottom of the washer to get the clothes out but they can all fold. They may not be able to sweet the grass outside due to allergies but they can all sweep the floors inside. My point is this: everyone can do something. And shouldn’t they? Aren’t they all benefitting by being a part of the family? My mom recently reminded me of a great way to handle the dishes. If you cook, you don’t have to clean. So, we have been using that instead of assigned nights and guess what? I not only have help cooking most nights, I don’t have to do hardly any dishes at night! I do still have the occasional one that gets missed or the nights where we don’t get them done before church so I do them after the girls are in bed. But, I am doing a whole lot less in the kitchen than I used to because I have willing helpers. Most of the time. We are implementing a new schedule this fall and as part of their morning routines, each girl will be completing a chore. I ended up writing it as chore on the schedule because I couldn’t come up with a better word for it. Job really isn’t better. But, when we discussed our schedules, they all understood and so far so good. Everyone is contributing and things are getting done. As for the contributing they do? Bathrooms gets cleaned. Laundry gets washed, dried and folded. Floors gets swept. Windows gets washed. Trash gets taken out. Dust is wiped away. And we don’t have too many days where we have to do a huge clean of the whole house. Is it perfect? No. But nothing is. Does it work well for us for now? Yes. And I’ll take that. 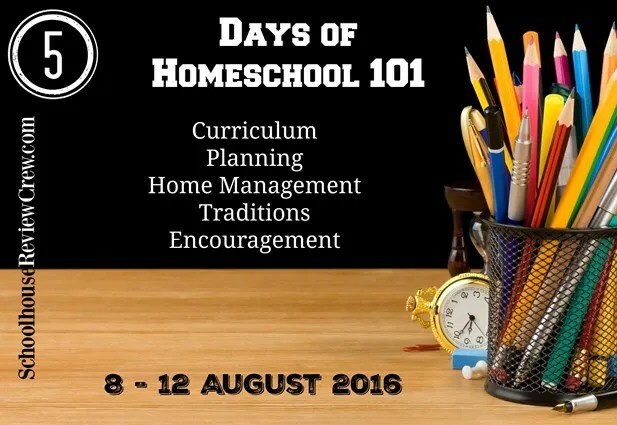 This post is the third in a series for 5 Days of Homeschooling 101 and is part of the TOS Review Crew Blog Hop. To read more please visit the Review Crew post or the link up to read more on planning and to get a whole bucket full of idea to help you plan. If the linky doesn’t show up below, please just head over to the Review Crew post to find the link up. 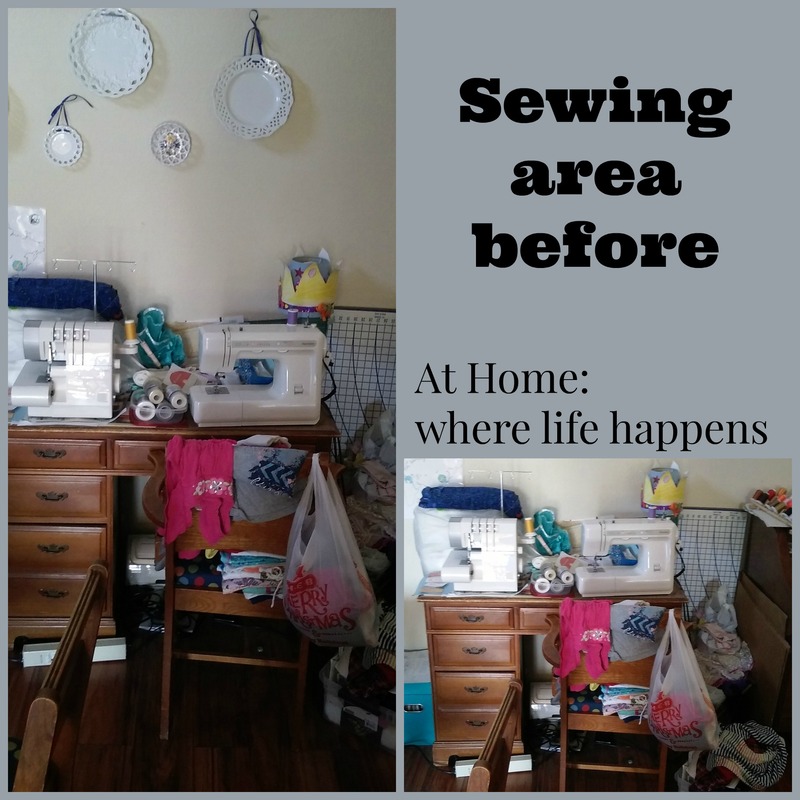 A month ago, I determined that I HAD to do something about the sewing area. It was driving me bananas and I had to work to clear it all out and off before I could do anything, even a simple mending. Since then I have been pondering and thinking and looking. I have gone from place to place in town looking for just the right things to help create this space and turn it into the creative area I want it to be. Turns out, I needed to think outside the box. Literally. I had been looking for box-style storage. You know, those 9×9 or 12×12 squares in shelves. I thought that was exactly it. But, every time I looked at them, it just didn’t seem right. Today, I hit my boiling point, so-to-speak. That space was getting cleared. TODAY. So, without having bought anything or found anything, I decided that I would just clear it out and throw some stuff away and get it useable. Then, I remembered something. We had a box we had built to go in a particular place a while back and it just didn’t work. I determined that it would help in this space. When I went to get it, I saw the drawer that we used to have under the crib and then under a bed. We had taken the casters off it and suddenly, it looked exactly like a shelf for my sewing desk. Armed with those two things and everything but the desk out of the area, I set to work. I don’t think I even had to repurpose anything else. But I like it. One of these days, I may get around to painting the desk. Or not. Who knows. 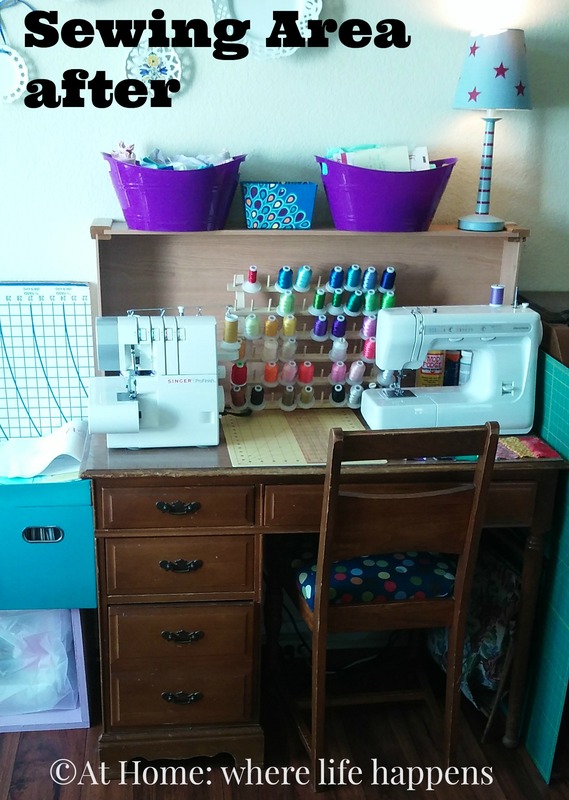 But I have a useable sewing area now and I think I will be sewing this afternoon. This has been one of those unique reviews in that the products we get to review are not homeschool curriculum or activities. Fun! Koru Naturals is a company the Review Crew had worked with before so I had heard quite a bit of buzz about it, though I did not participate in that review. We were given the chance to review several of their products. 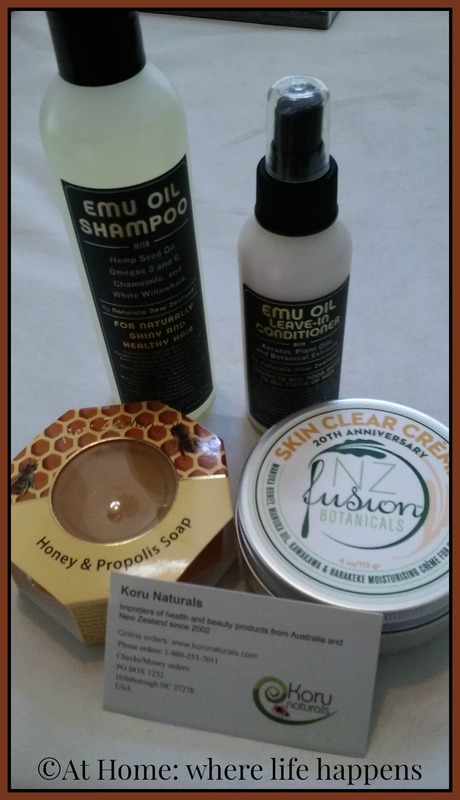 We received the Skin Clear Creme, the Emu Oil Shampoo and Emu Oil Leave-in Conditioner set, and the Manuka Honey Propolis Soap. Our family has a history of acne break-outs and difficult hair so these choices seemed the perfect fit for issues we were dealing with. This gave these products a huge appeal. Outside of the Review Crew run earlier this year, I knew nothing about this company. They are a company that is dedicated to bringing the traditions of New Zealand to the US. These traditions include using natural ingredients to enhance and promote healthy skin and life. They have been in business since 2002 and are always looking for ways to bring traditional healing and treatments combined with modern knowledge and technology. What a great combination. This set was an exciting possibility for us. Oily hair that is next to impossible to comb out is nothing new in our home. I have relatively thin hair that tangles easily and is oily. One of the girls has extremely thick hair that tangles to an almost impossible rats-nest with no encouragement and that gets very oily quickly. She and I both used the shampoo. She also used the leave-in conditioner. The shampoo is a thin, clear liquid that comes in a squeeze bottle. It has lasted very well and there is a lot left, even with two of us using it often for almost 6 weeks. The leave-in conditioner is a very thin liquid that comes in a spray bottle. This makes it fairly easy to apply evenly. I have really liked the shampoo. For my hair, it has worked well. It cleans it well, leaving it soft and easy to comb. It don’t have to blow dry it to get that nice soft, shiny look and feel. It stays clean looking and feeling for two to three days. The giggly girl that used the shampoo also used the leave-in conditioner. We are very disappointed in it for her. She has a difficult time finding any hair care products that work well for her. We typically change brands every month because what she is using starts giving her a variety of problems. 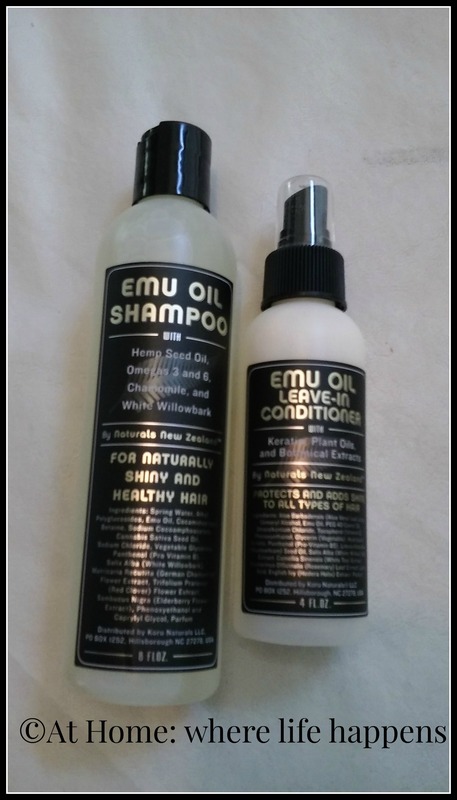 The Emu Oil products were no different, except that we have not felt that they worked from day one for her. These leave her hair difficult to comb and it looks and feels dirty straight out of the shower, even before using the leave-in conditioner. It has also caused her issues with dandruff. With the acne issues we have experienced, we were hopeful about this. A thin, runny lotion-like cream, the face cream is a leave-on product. After washing, this cream is applied and left-on. It comes in a pot with a screw-on lid and a small applicator to keep from getting dirt and oil in the product. Since you use a small amount each time, this should last us months. You can barely tell she has been using it daily for 6 weeks. Consistency is key to using a product like this. When it was used consistently, we saw great improvement in pimples and some improvement in black heads. She will continue using this, though I don’t know at this time whether we will buy more when we reach the end of this pot. With how much is left (A LOT! ), I don’t have to make that decision for a while. *There is a note on their website that states this should not be used during pregnancy. I have really liked this soap. The shape is fun to begin with. Shaped like an octagon, it reminds me of its main ingredient – honey. 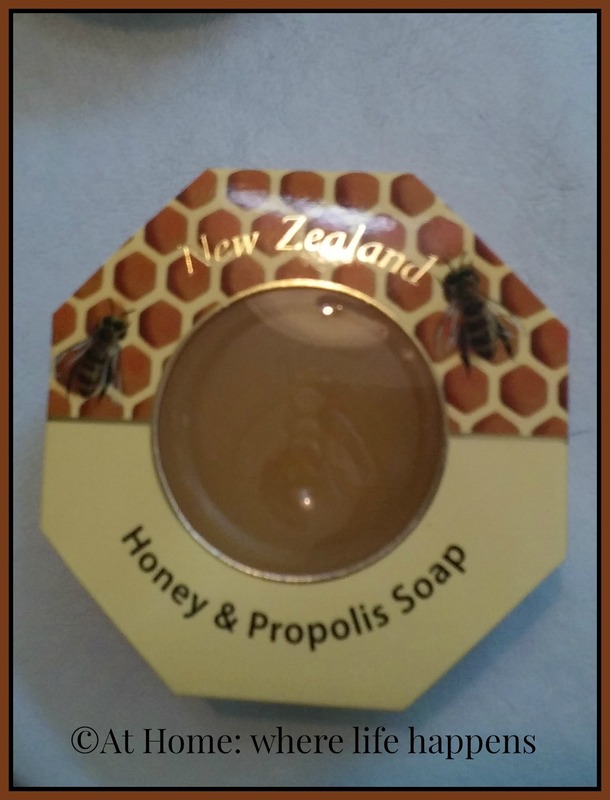 Made of Manuka Honey and Propolis, this has been a nice soap to use. It lathers us well, making it a good shaving cream. It also washes off nicely, leaving a clean feeling. My only issue with it is that it disappears quite quickly for a bar of its size. Something to do with how quickly it lathers, I guess. I do really like this soap. Some nice things about Koru is that they list ingredients on their website. They are very clear about what is in their products, allowing you to make informed decisions about what you are purchasing. If you have allergy issues, please be certain to check the ingredients. 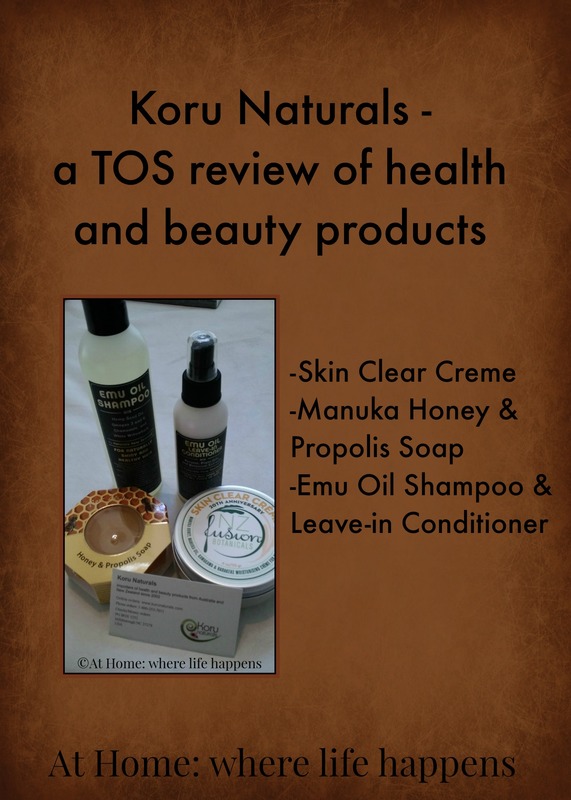 Our first experience with Koru Naturals has been pretty good, over all. I am pleased with the products we received and the way they work. The issues with the shampoo and conditioner are less about the product itself and more about the way an individual reacts to the ingredients in the product. We have yet to figure out which ingredients are the ones that work well or cause issues so the issue is certainly not Koru Naturals’. I recommend checking out Koru and seeing if what they offer would be good for your family. 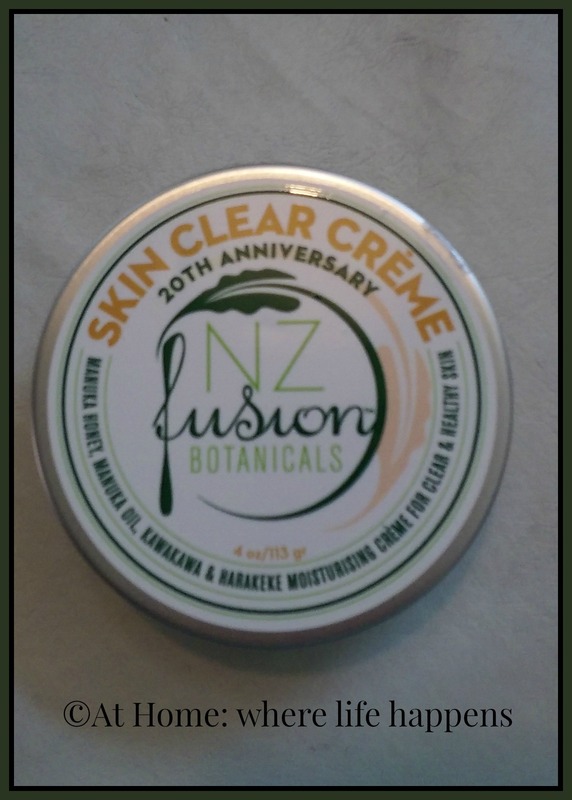 Be sure to read additional reviews from the Crew on the wide variety of products we have been using, including Skin Clear Cream, Manuka Honey Propolis Soap, Argan Oil and Sandalwood Hair Tonic, Emu Oil and Blue Tansy Oil Cream, Emu Oil Shampoo and Emu Oil Leave-in Conditioner, Manuka Honey and Manuka Oil Facial Cleanser and Manuka Honey, Tamarind and Manuka Oil Facial Toner. 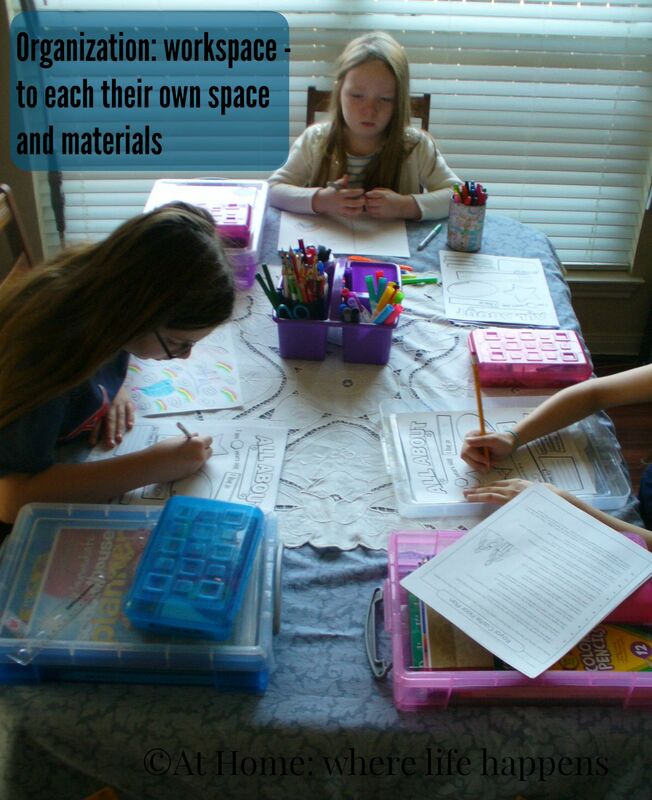 The debate goes back and forth in my mind as to whether we need a dedicated homeschool room or if a planned use of space is good. For another year, or at least day, I am sticking with the planned use of space. What I mean is . . .
we are using the dining room table. Each child has a space at the table. Their materials fit within their designated space. The girls know what to grab, where to put it, and where their area is. And it works. I like it because they know what to do. But even better is that we are all together. Yes, sometimes there is bickering. Yes, sometimes we are cramped. But, we are able to work together easily and the girls often jump in a help each other when there is a problem. Peer tutoring is build right in. Homeschool happiness, right? And, I’ll bet you want to know more about the boxes. Those are the boxes that they decided to organize last week in order to get school moving. Blue, pink, and purple – those are the colors I try to buy anything in that is related to school supplies. Doesn’t always work so the girl with purple sometimes gets green but she’s okay with that. 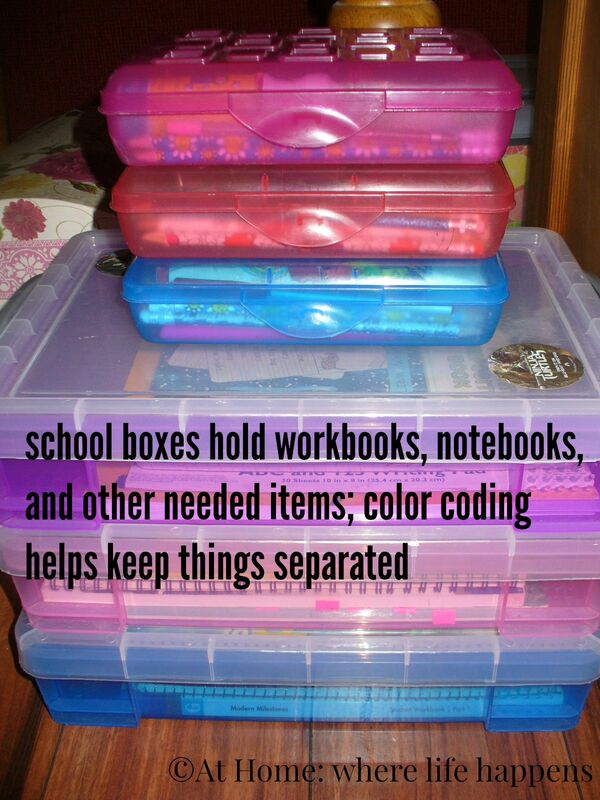 The large, flat boxes are big enough to hold most workbooks, spirals, papers, and a few other things. The girls put their notebooks (book logs, journals), workbooks (Spelling You See, Dynamic Literacy, Horizons, etc. ), rulers, colored pencils, and whatever else they might need. Each girl also has a pencil box of the same color. Those hold crayons, pencils, pens, highlighters, erasers, pencil sharpener, and a few other odds or ends depending on the girl. We have just recently added this dresser to the space. It has our paper tray on the top, along with the carrier that has dry erase markers, colored pencils, markers, and more. 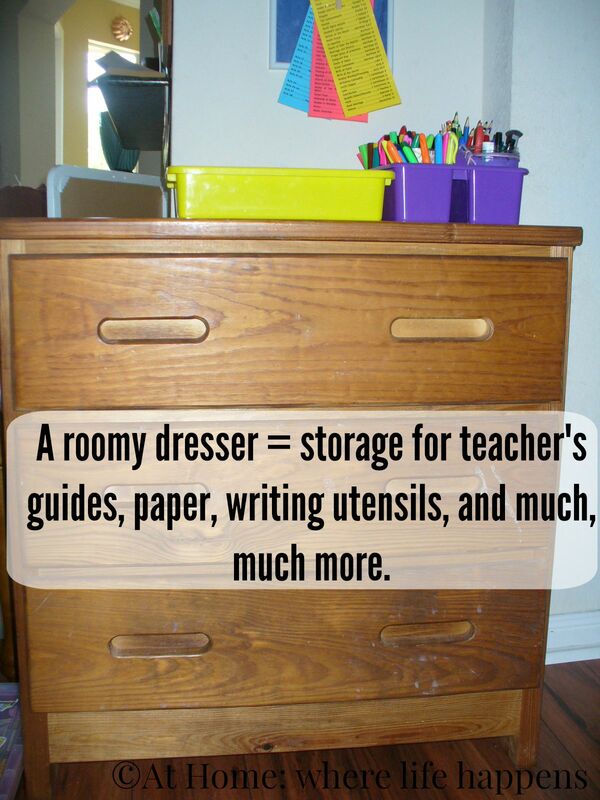 The drawers will be used to hold teacher materials and Bible Bowl materials. It is going to be getting a facelift very, very soon. We keep our additional curriculum, supplies, and books elsewhere through out the house. These are things we need each day and so we keep them within easy reach. That is quick tour of the workspace organization of our homeschool. Evaluated your space. It isn’t feasible for everyone to have a dedicated school room. What makes sense for you? If you don’t have a dedicated room, how much space do you actually need? This will vary depending on how you school, the age of your children, and the style of curriculum you have chosen. Once you know where you’ll be working, mostly, work on space for holding materials. 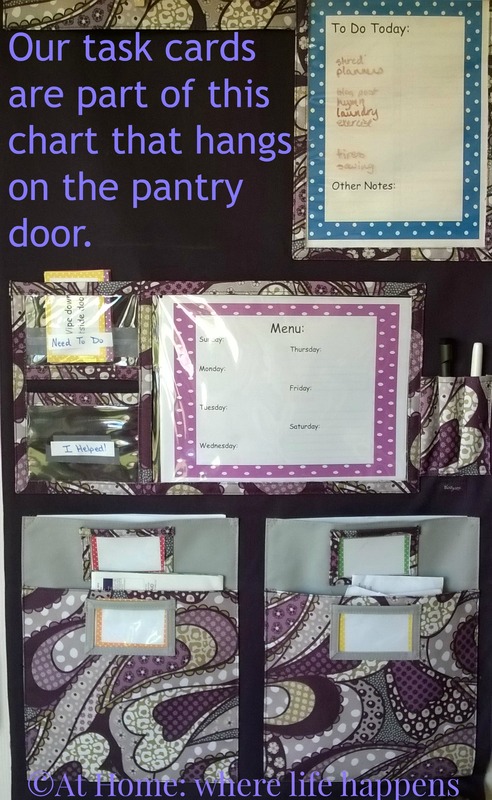 If you are using a multipurpose space, try to choose something that is easy to get out and put away at the end of the school time. 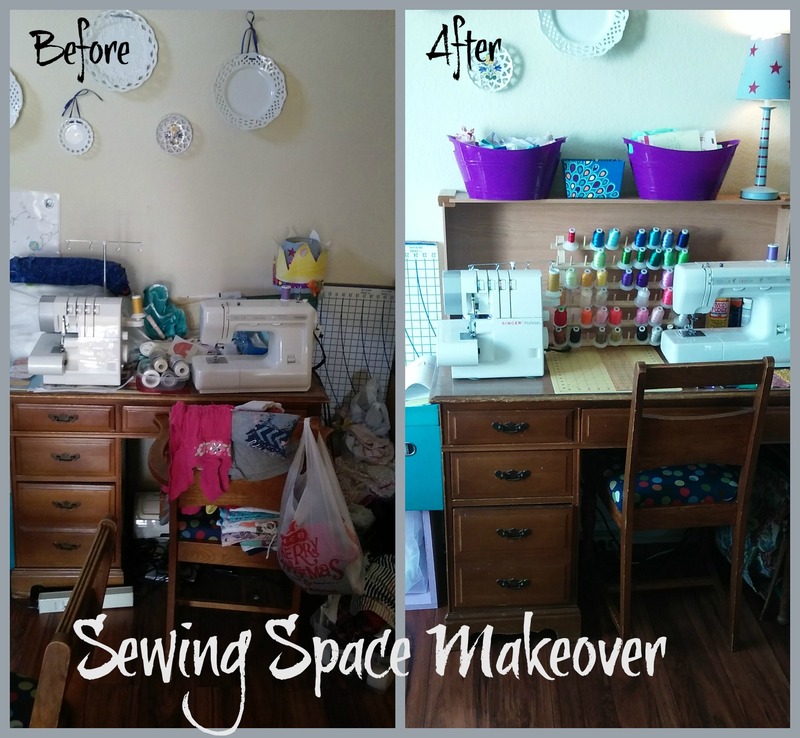 Do you have a dedicated room or do you use a space, as we do? 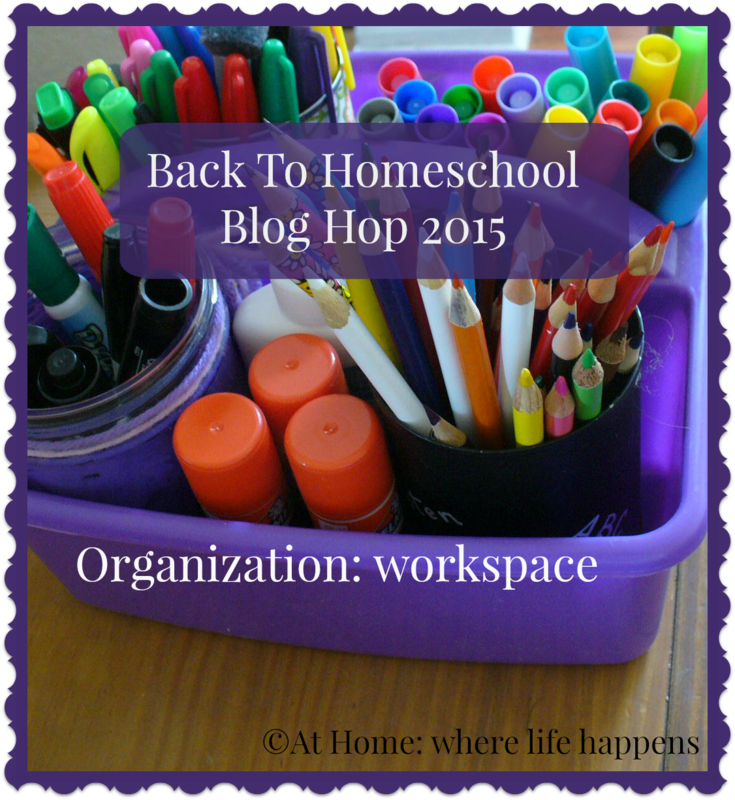 A list of all posts related to the Back To Homeschool Blog Hop 2015 came be found under the Back to Homeschool page. 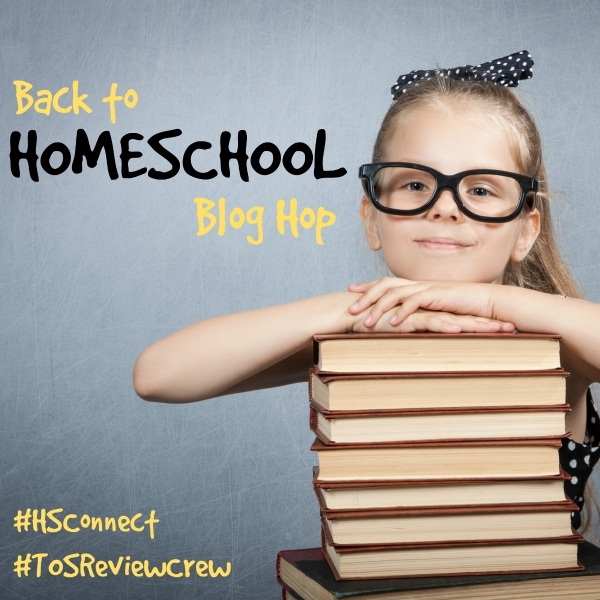 This post is part of the Back To Homeschool Blog Hop, sponsored by School House Review Crew and Homeschool Blogging Connection. There are over 50 bloggers participating in the blog hop so you have lots of reading to do! Click on the picture to be taken to the listing of all participating bloggers and find something to encourage you today. Summertime and the eating is good! Do you love summertime foods? If you remember a couple of weeks ago, the middle gigglygirl, L, guest posted over at Farm Fresh Adventures with her lemonade recipe. This is part of a series that Lisa is doing on her blog, titled Fresh From the Kitchen. I am looking forward to all the posts that she will be sharing this summer. 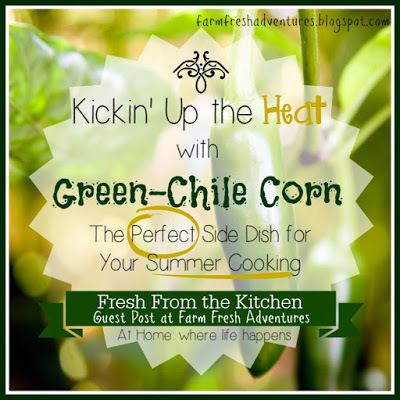 Last week, I shared one of my favorite summertime foods – Green-chili Corn. Well, really, I enjoy it all year long but summertime fresh corn adds a yummy-ness to it that frozen corn just doesn’t have. So head over to Farm Fresh Adventures and get the recipe. Then, make the simple dish and sit back and enjoy! I have struggled with “chores.” I hate the word. Truly. Using it makes me feel like a mean old geezer. I would much rather encourage my children to see what needs to be done and learn to do it cheerfully. 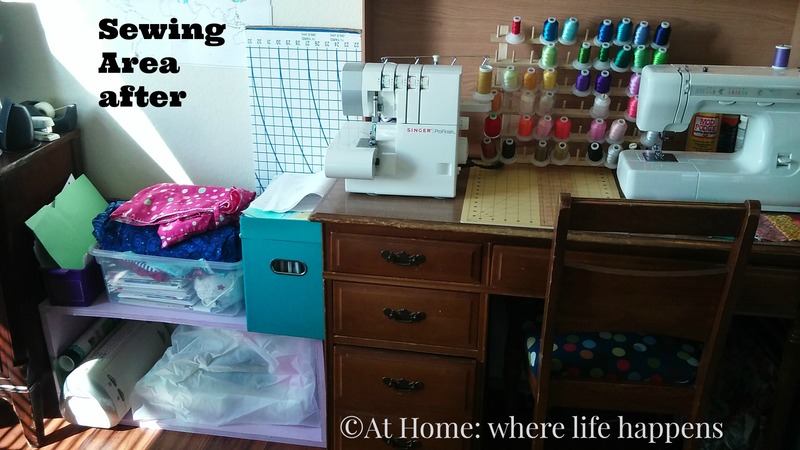 Towards that end, I have been scouring the internet, friends, Pinterest, and my own creativity, as well as that of the girls, to come up with something that might work. So here is what we are going to be trying out. There are 30 different cards, each with a different task on it. I printed them and they will get laminated as soon as we can get to Mardel’s to do so. 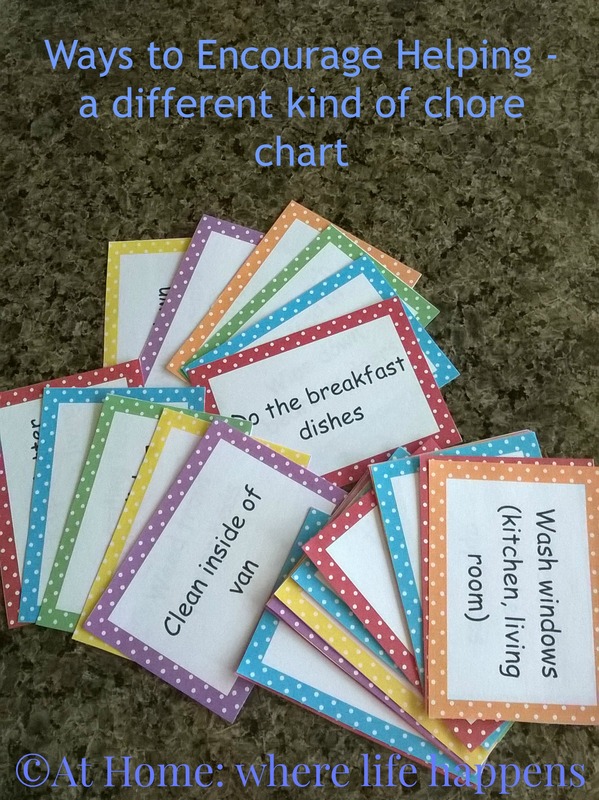 The cards will go in a pocket on a chart we keep on the pantry door in our kitchen. There are two pockets there. One is for the “need to do” cards. This is where all of the cards will start out. Each child, as well as myself, will strive to complete a minimum of two tasks each day. Any card in the “need to do” pocket is up for grabs so each person can choose something that they want to do or they saw that needed done. Once they have completed the task, they will use a dry erase marker to put their initial on it and place it in the “I helped!” pocket. If it is a task that needs done daily, I will make sure they get done by the end of the day and then put them back in the “need to do” pocket. 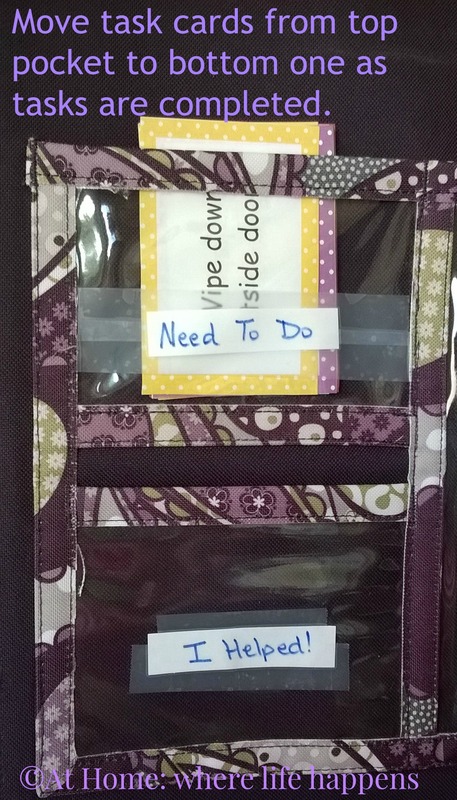 If it is something that needs done once a month, I’ll leave it in the “I helped!” pocket until the beginning of the next month. An example of this is cleaning the ceiling fans. Otherwise, these are weekly tasks. Or at least that is the goal. Hopefully, this will make a difference in the amount of helping that gets done without my pleading or even asking. I am hoping this will help them all become more aware of all that needs done in our home. I have included a copy of the cards that I made for this. I also left a link to the TPT store of the lady who was gracious enough to allow us free access to her frame set if you want to print your own with more personalized tasks. If you use our idea in a blog post, please link back here but do feel free to use this idea. Hopefully it will work for you, too. I don’t know how this will work out but I am hopeful. The girls all had input on this system so perhaps with all of our brains working together we have come up with a system that will work for all of us. I’ll let you know after we’ve worked with it for a bit.